Splines are the most used object in any normal animation done with Synfig, and the Spline Tool allows you to create them. 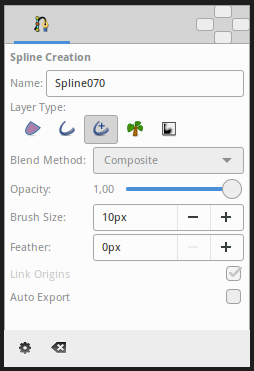 The "Spline Tool" button (AltB) puts you in a create Spline mode. To leave that mode just select another tool from the toolbox. Single click creates new vertices. "Tangent" value is set to (0,0) and the vertex becomes a sharp corner. Click and drag creates new vertices and allows the modification of the tangent value at that vertex. Extending the tangent smooths the corners. Each new vertex is attached to the previous by a "Bézier spline" defined by the vertices's position and it's tangents. The Spline is created sequentially; One vertex follows another. The end point of the previous Spline arc guides the next arc created until you close it. The next created Spline will be independent of the previously created Spline. You can tweak the newly created vertices by clicking on handles and dragging them. For tangent handles: Command:Split tangents will split the tangent so that you can independently modify the arch of an end point of a bézier curve. Command:Merge tangents will merge the independent tangents so that you can align the arches of the end points of two connecting bézier curves. For vertex handles: Command:Loop Spline or Command:UnLoop Spline (depending on if it is already looped or not) allows you to close or open the spline. Command:Delete vertex allows you to delete the vertex. You can also right click in the middle of a bézier curve. Command:Insert vertex allows insertion of a vertex (and set its tangents intelligently according to the neighboring vertices' values) where you clicked. Or click on the gear button of the Tool Options Panel. To clear out the working Spline, press the Esc button. Name : The name of the Spline that you will create is set by the text input box. In this case it is "NewSpline007". This input text will parse the end of the string if any integer number is found, increasing that number for the next time you create other Spline. If not number is found it adds a three digit number for the next Spline created. Layer Type : Whether create Region and/or Outline, Advanced Outline, Plant and Curve Gradient layers. Blend Method : The blending method used to composite on the layers below. Opacity : Sets the Amount for new layers. Defaults to 1.00 (Completely opaque). Brush Size : Sets the size of the line for Outline Layer and/or Advanced Outline Layer. Feather : There you set the feather parameter of the Region or Outline Layer created. Link Origin : If enabled it links the Origin for the Plant, Region or Outline if two of them (or all them) are checked. See this video tutorial to see it in action. Read Creating Shapes which talks a little about the Spline tool. Read Dev:Spline_Bline about tangent internals computation. Read Dev:Bline_Speed which explains about variations in the Amount parameter of Splines. This page was last modified on 7 March 2016, at 18:50.